There are just days to go before the excitement of the 35th America's Cup in Bermuda. Find out when to watch, so you never miss the action! The 35th America’s Cup will see almost five weeks of world class sailing action. The event will start on 26 May, with a Dock Out Show and Pre Race Show Starts from 4.15pm (local time) in the America’s Cup Village in Bermuda before live racing at 5pm (local time). Race One of the Louis Vuitton America’s Cup Qualifiers will be a battle between the Defender, ORACLE TEAM USA and Groupama France. Two time America’s Cup winner, Jimmy Spithill, and his crew will be looking to start their defence of the cup in style against the team led by French superstar Franck Cammas. Jimmy Spithill believes the 35th America’s Cup will be “one of the hardest, most competitive America’s Cups in its long history”. The race will be the first time the America’s Cup Class (ACC) yachts and their sailing crews engage in full competitive action. In the weeks leading up to the first match, the teams have only been able to see their rivals’ performance during the practice sessions on the waters of Bermuda’s Great Sound, where all the America’s Cup racing will be held. The ACC race yachts are wingsail, cutting-edge catamarans that foil above the water at tremendous speed, designed and created by each of the six America’s Cup teams racing for the oldest trophy in international sport. All the 35th America’s Cup races will take place on the waters of Bermuda’s Great Sound. 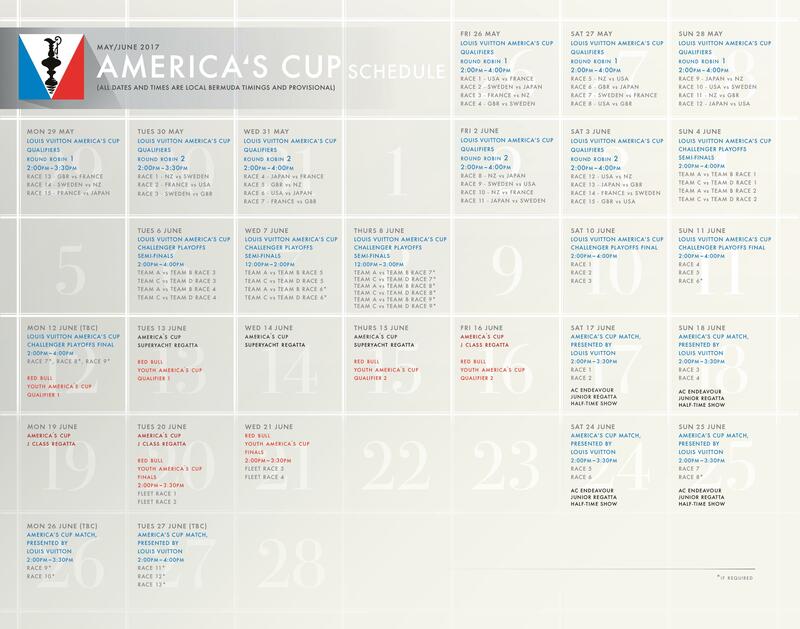 Download the full 35th America’s Cup schedule here. Five-time America’s Cup winner, Sir Russell Coutts, who is now CEO of the America’s Cup Event Authority, said he was looking forward to seeing some “fierce competition” between the teams. “All the America’s Cup teams now know who they will line up with in the Louis Vuitton America’s Cup Qualifiers, allowing them to plan their race strategies for each of their double round robin races,” he said. “One thing that is certain is that nobody can predict who will come out on top. That uncertainty, especially having seen how all the teams are so closely matched, shows why interest in the America’s Cup is growing so quickly worldwide,” he continued. A range of support events will also be held during the 35th America’s Cup. These will include the Red Bull Youth America’s Cup which will showcase the best national youth teams from around the world racing in AC45 foiling catamarans, currently taking centre stage in the Louis Vuitton America’s Cup World Series. “In addition we have the America’s Cup Superyacht Regatta and the America’s Cup J Class Regatta, featuring the most spectacular superyachts afloat today and some of the most famous America’s Cup yachts of old, all racing on the turquoise waters of Bermuda,” continued Sir Russell. “The combination of all these elements add up to why I firmly believe this will be the greatest America’s Cup ever,” added the New Zealand-born sailor. Skipper of ORACLE TEAM USA and three-time winner of the America’s Cup, Jimmy Spithill, said the action in Bermuda will be unlike anything seen before. “The physical and mental demands on the athletes on board have gone up exponentially – the catamarans will be faster than last time, more manoeuvrable, and likely will foil all the way around the race track, given the right conditions,” he said. “Most importantly, I think the competition is going to be fierce. We have six great teams preparing for racing next year and this is quite possibly shaping up to be one of the hardest, most competitive America’s Cups in its long history of over 165 years of battle,” predicted Spithill. The racing format of the 35th America’s Cup in Bermuda features all six America’s Cup teams competing in the Louis Vuitton America’s Cup Qualifiers, the round robin match racing that kicks off the 35th America’s Cup. In these opening two rounds, each competitor races every other team twice, with the challengers battling for the right to advance to the Louis Vuitton America’s Cup Challenger Playoffs (only the top four advance), which starts on 4 June, 2017. The current Defender, ORACLE TEAM USA, then moves straight into the America’s Cup Match, presented by Louis Vuitton, in which it will take on the winner of the Louis Vuitton America’s Cup Challenger Playoffs. The teams finishing first and second in the Louis Vuitton America’s Cup World Series will carry two and one points respectively into the Louis Vuitton America’s Cup Qualifiers in 2017. This will put even more pressure on all the competitors to finish the last Louis Vuitton America’s Cup World Series event in November 2016 in Fukuoka, Japan as strongly as possible. The top four challengers from the Louis Vuitton America’s Cup Qualifiers will split into two semi-finals and this second stage of the 2017 competition will run from 4-12 June. The winners will take part in a finals competition to determine which team will take on ORACLE TEAM USA in the America’s Cup Match, presented by Louis Vuitton. Also at stake in the Louis Vuitton America’s Cup Qualifiers is a bonus point for the America’s Cup Match. If the team that wins the Qualifiers (whether Defender or a challenger) also advances to the Match, it will start with a one point advantage. ORACLE TEAM USA will not compete in the Louis Vuitton America’s Cup Challenger Playoffs. While the challengers improve through the heat of competition, the Defender will need to prepare on its own for the final showdown and the races for the 35th America’s Cup. There will then be a break in America’s Cup Class racing between 13-17 June, 2017, where Bermuda will play host to the America’s Cup Superyacht Regatta, the qualifying stages of the Red Bull Youth America’s Cup, and the America’s Cup J Class Regatta. Finally, on 17 June, 2017, ORACLE TEAM USA will take on the team that has fought its way through and earned its place in the America’s Cup Match. From 17-27 June, 2017, the two teams will go head to head in a series of races to be first to claim the seven points needed to win the America’s Cup 2017. There is a short cessation of hostilities from 19-21 June, 2017 when the final stages of the America’s Cup J Class Regatta and the Red Bull Youth America’s Cup finals will take place. The final of America’s Cup Match begins again on 24 June, 2017.